Do you own a machine or device and are you unsure whether using a wireless remote control would benefit you? On this page we list four advantages of a wireless remote control. An industrial remote control allows you to operate the device or machine without interfering with cables. This means more freedom of movement and you are not limited to the maximum length of a cable. Cable controls usually require more maintenance because cables tend to wear out more quickly in industrial environments. A wireless remote control can be carried or kept in a car kit. It puts control at your fingertips wherever you are and allows you to operate the machine or device in any circumstance. This saves you a lot of time and allows you to do more in the same amount of time. In specific cases, you will need fewer people with the help of a remote control, which will positively benefit your cash flow. The safety of your employees is a core issue. Depending on the situation, your radio control can provide much better safety over a wired control. Remote control of the machine gives you a better overview and allows you to react quicker in emergency situations. If you want to focus more specifically on a safer working environment, we even a have wireless control system that can be a reliable addition to your emergency systems: the wireless emergency button. 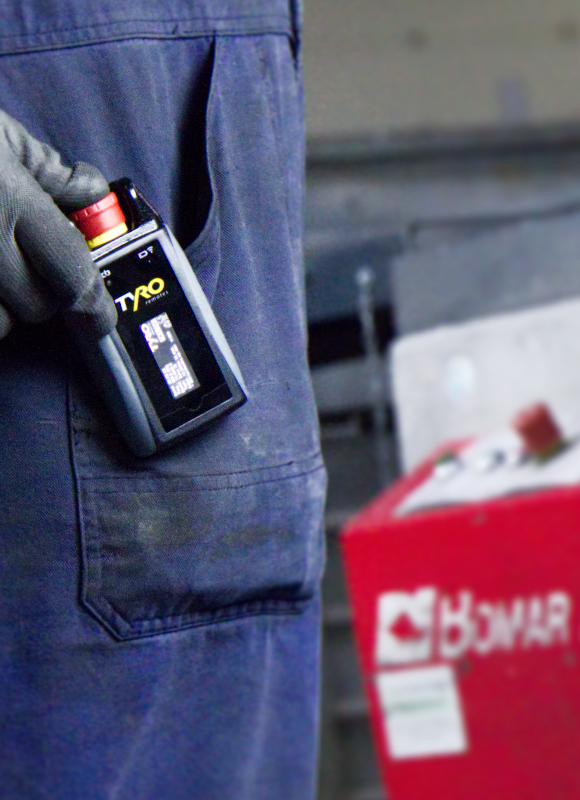 An industrial remote control from Tyro Remotes can be customised and configured as required. If you want your own icons on your buttons, if you want the buttons to work differently, or if you want specific information to be fed back to your remote control, then this is all possible. For example, choose the number of channels or functions, a remote with your own logo, display or, if necessary, a display containing your own logo. A wireless remote control can provide improved usability down to the last detail. Interested to find out more? Our specialist team are happy to help you! Please don’t hesitate to contact us via phone or by using our contact form.